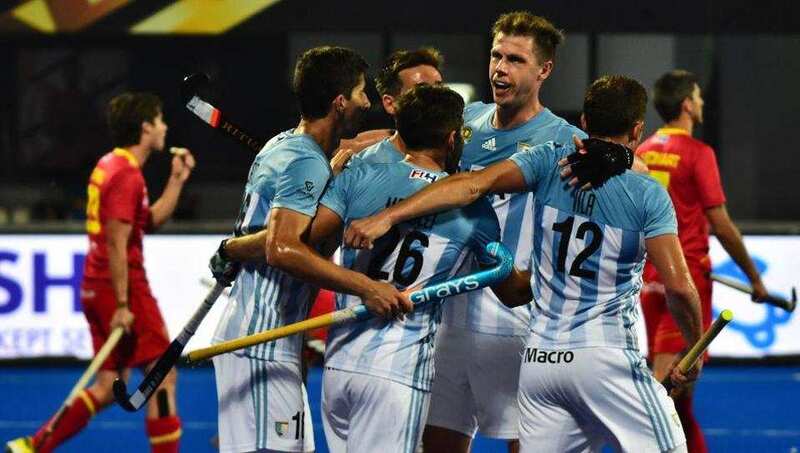 Bhubaneswar: Agustin Mazzilli and Gonzalo Peillat scored a brace each to help Olympic champions Argentina eke out a 4-3 win over Spain, while New Zealand scrapped past France 2-1 in their opening matches of hockey World Cup here Thursday. Mazzilli 4th, 15th minutes and Peillat 15th, 49th were the goal scorers for Argentina, while Spain's goals came from the sticks of Enrique Gonzalez 3rd, Josep Romeu 14th and Vicenc Ruiz 35th. In the day's second Pool A match, New Zealand scored two field goals through Kane Russell 16th and Stephen Jenness 56th to get the better of France. France's lone goal came a minute away from the final hooter through a penalty corner conversion by Victor Charlet 59th. In the first game, Spain stunned the Argentines as early as in the third minute through young Gonzalez's fine field strike past Argetina goalkeeper Juan Vivaldi from a move which he only started. It was an end-to-end battle as Mazzilli 15th minute again came to Argentina's rescue, equalising 45 seconds from the first quarter after receiving a pass from Lucas Villa on the left side. Just seconds away from the first break of the match, Argentina scored again when dragflick specialist Peillat 15t converted a penalty corner with precision to hand his side the lead for the first time. Five minutes after the change of ends, Spain equalised through Ruiz's 35th field strike.